A teacher in a school for wealthy young ladies, Sheridan, Bromleigh is hired to accompany one of her students, heiress Charise Lancaster, to England to meet her fiance. When her charge elopes with a stranger, Sheridan wonders how she will ever explain it to Charise's intended, Lord Burleton. 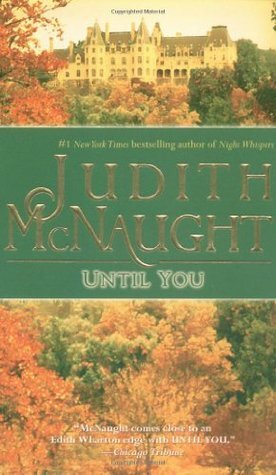 Until You is #3 in Judith McNaught's Westmoreland saga. This is my first reread of a book for this year - it is so long ago since I read this book that I had forgotten much of the story. This fact has made me hopeful that many other favourites that sit on my shelf could do with a rereading and will be like reading an unread book. Shock! Horror! Sheridan - the heroine has had rather an unusual upbringing - a father who enjoys roaming the countryside going where the spirit moves him, also Rafe a gambler and an old Indian, Dog Lies Sleeping. She is a spirited lass, who can ride the wildest horse and entertain the local camp sites with her singing. That all ends when her father drops her off at his sister's place, where she is educated in the more usual way of women of the time. Later in England, while she has lost her memory, she hasn't lost her spirit or her innate kindness and thoughtfulness. When she arrives in England she comes under the care of the Earl of Langford - who starts out as a very caring, compassionate type of man, even if he is at first driven by a little guilt. However mainly he has a great sense of responsibility. As the story twists and turns he becomes somewhat obtuse and unbending. I am not sure that I really like that ploy in a story! He believes that Sheridan has been leading him along with a supposed memory loss and that he can't forgive. It takes all the wiles of his extended family to bring him to his knees. I enjoyed my revisit with this book, it has encouraged me to reread the remainder of the Westmoreland saga, although I have to say the contemporary books of Judith McNaught are ones I have on my 'keepers' shelf as well. How many of you when you reread a book after many years find you have forgotten a good deal of the book - and if I'm honest in this case I had forgotten most of it! I love Judith McNaught books and have kept them on my keeper shelf. I have also reread them many times. As a whole, this wasn't a great book for me, but I love re-reading certain scenes. I love Judith's books, and the Westmoreland series was a favorite. I do forget books I've read years ago, some thing do come back or seem familiar, but that's okay.